Save up to 35% Daily deals. 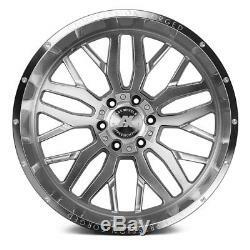 AXE AX1.1 Compression Forged Wheels 22x12 (-44, 8x170) Silver Rims Set of 4. In Stock (12): Ships within 5 days. On the go Daily Deals. 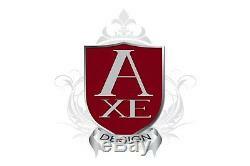 AX1.1 COMPRESSION FORGED Silver Milled with Mirror Lip wheels by AXE®. 22" x 12", -44 Offset, 8x170 Bolt Pattern, 125.2mm Hub. State of the art wheel production process, the rim of the wheel is Compressed at high speed and the aluminium is forged to the required specifications. This technique is called Compression Forging. The process not only enhances the strength of the wheel but also creates a much lighter wheel than normal cast wheels resulting in enhanced vehicle performance and greater fuel efficiency. Lip Size, Concavity, and overall Appearance, may vary depending on Vehicle and Wheel Size. Once Tires are mounted onto Wheels, the wheels become Non-Returnable. Feel free to contact our dedicated Wheel & Tire team with any questions. Make your vehicle look exclusive. Have many understated design details. Built using innovative Compression Forging Technique. Extremely tough and durable construction. Up to 30% lighter than cast wheels. Up to 30% stronger than cast wheels. Ensure increased acceleration and better MPG. We know how much of a financial investment you're making in a set of wheels or wheels and tires, and in return we'll deliver service and product that is second to none. We take pride in our fitment information and don't take our fitment guarantee lightly. You can depend on the fitment advice from our professionals because they have decades of knowledge and experience to draw from. Research the brands of equipment we use and the wheel accessories we offer and you'll find they're the finest in the industry, because we want you to have the best. The combination of products and services we provide cannot be matched, especially by a local tire store. No matter whether you're doing basic repairs and maintenance, modifying your car's street appeal and performance, or adding high-tech lighting and electronics, our great selection of brand name products and knowledgeable associates will ensure success with all your automotive projects. We offer the finest and widest variety of automotive parts and accessories using state-of-the-art technologies, and employ the most dedicated and creative team members. These individuals focus on exceeding expectations of customers who want the exact component at the best price in the quickest time. Our goal is to provide a WOW experience during every customer interaction. Whatever you need, whether it's a replacement part to fix a broken down vehicle, a crash part to repair a vehicle from an accident, perhaps a new set of custom wheels and tires, or something to make it flashy or faster, lifted or lowered, we will be your one-stop shop. We fulfill our mission daily with enthusiasm and optimism, learning from our ongoing opportunities and successes. We enjoy a modern yet tricked out work atmosphere while ensuring a true learning environment to develop our people. 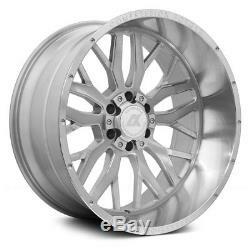 The item "AXE AX1.1 Compression Forged Wheels 22x12 (-44, 8x170) Silver Rims Set of 4" is in sale since Wednesday, July 4, 2018. This item is in the category "eBay Motors\Parts & Accessories\Car & Truck Parts\Wheels, Tires & Parts\Wheel Lugs". The seller is "caridwheels" and is located in Orlando, Florida. This item can be shipped to United States.